Atoms are made of charged particles: positive protons in the nucleus and negative electrons orbitting in the shells (there are also neutral neutrons in the nucleus but we don't need to worry about them for now). The electrons are very small and a long way from the nucleus; they can easily be removed from the atom. If they are in a metal, which has lots of free electrons that can move around, they will flow as a current. Metals are called conductors. If they are in an insulator, a non metal, they will stay stationary as a static charge. You can build up charge on an insulator by rubbing it against another insulator. If it loses electrons it will become positive but if it gains electrons it will become negative. Two like charged will repel each other but two opposite charges will attract. 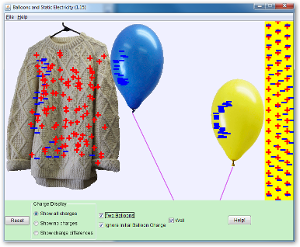 Have a look at the simulation above which shows how a balloon can stick to a jumper. If you rub a balloon on your jumper, electrons will move from the jumper to the balloon making the balloon negative. If we move the balloon towards the wall, it repels all of the electrons in the wall, making the surface of the wall positive. It is then attracted to the positive wall. Remember only negative charges move around. If too much charge builds up on an insulator and it is brought near a conductor there will be a spark as the electrons travel into the conductor.